When I started blogging, everyone used an RSS reader and your RSS feed was the way of getting your new content in front of people. The use of RSS has dwindled, at least for us because the readership here on Yoast has quadrupled over the last 2 years but the number of RSS subscribers is now less than 1/4th of what it was 2 years ago, let alone the traffic. We had passionate discussion about full-length RSS versus summaries in those days. Full length would mean people could read your content but would not get to your website, meaning you’d have less ad views, if that was how you made money. On the other hand, especially tech savvy people preferred full length RSS because it was easier to read. In fact, I think a lot of people who still use RSS still do prefer full length RSS. There’s just so few left. Using our Google Analytics plugin we’ve been tracking RSS click throughs to our site for several years now and that statistic tells a tale of steady decline slowly going to zero: FeedBurner, which I used to love with a passion died quickly when it was bought by Google and in the last few days I’ve actually, finally, made the move off of FeedBurner to FeedPress, which is a rock solid replacement. It shows us as having around 12,000 RSS subscribers. If you consider we had just 2,340 clicks from RSS last month (which is less than 0,5% of our traffic), you could argue that 12,000 RSS subscribers doesn’t necessarily help us much, but we honestly also don’t really know because we don’t know who read our posts. So RSS is becoming less important, at least to us. At the same time, RSS is not without its dangers from an SEO perspective. Scraper sites have been feeding (pun intended) off of RSS feeds for years, pulling in all the content and republishing it in the hope of ranking in the search engines with that content. This lead to duplicate content problems in the search results which had to be mitigated, or a scraper site with a bit more authority than your simple blog would simply outrank you with your own content. 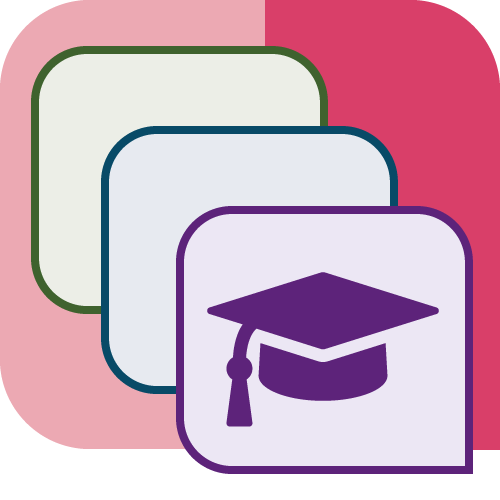 From the very beginning our Yoast SEO plugin has, for that reason, had functionality to add links back to your site at either the bottom or the top of those RSS feed articles. This practice, which we first invented in January 2008 in our RSS footer plugin, worked like a charm for quite a while. It showed search engines the original source of the article and while a large portion of these scrapers removed all links, the few that let the links go in actually helped in getting Google especially to float the right content to the top. We actually used that functionality ourselves to add some more links to specific pages on yoast.com to help those pages rank. Now over the last few years while checking the rankings of those pages for the specific keywords we were targeting, we saw a trend of steady decline in rankings. This is almost certainly the result of Google treating too many exact anchor texts as a negative. 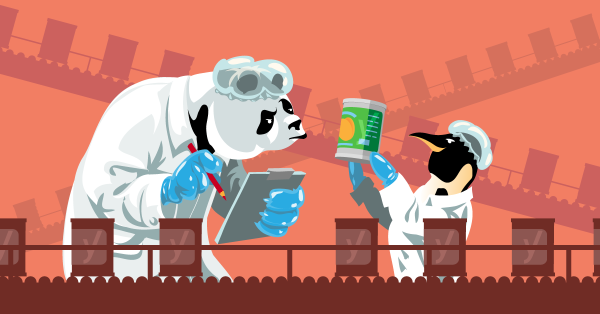 When Google released their Panda update / filter, that hit a lot of scraper sites and the duplicate content ranking problems began to be somewhat less of a problem. If a truly high authority site copies your content and doesn’t link back you’re still done for, as you stand no chance of ranking. “Silly” scraper sites had a bit more of a hard time ranking. But linking back the way we used to was still a better solution than doing nothing in our experience. 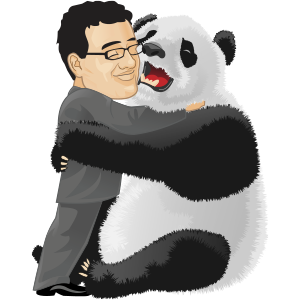 Overall, I was rather happy with Panda, it seemed the first time in a couple of years where Google had really made a difference. 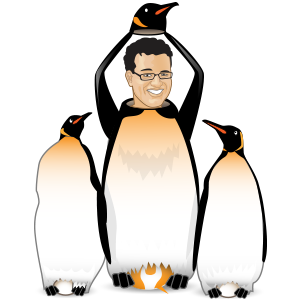 Among our site review customers we’ve historically had a fair portion of Penguin victims. Google’s Penguin update should be hitting sites that have lots of low quality links pointing at them. You can probably guess how this is a problem… The sites that had used to help us rank our own articles a couple of years before, were now dragging us down. To be honest, I’ve not seen a site that was hit by Penguin purely based on these RSS scraper links. Usually there were large portions of other, problematic, usually obviously paid for, links. More recently though, we’ve seen more and more people who needed to do link removals and / or disavow for sites that had links because of scraping their RSS feeds. So what was once a best practice is now a bad practice. As a result, we’re slightly changing how the functionality in WordPress SEO works as of the next version. If you’ve had it configured to link back to you, you don’t need to do anything if you don’t want to, the only change is that those links will be nofollowed from now on, so Google doesn’t count them. We’ve added a filter nofollow_rss_links that defaults to true. If you return false on that filter the nofollow will be removed but there will be no option to do so in the settings area for the plugin as I think it’s a bad idea. 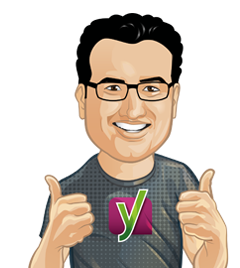 I’m not 100% sold yet on whether that approach is a good idea for everyone, but in our good old tradition of eating our own dog food we’re going to try it here on Yoast first to see what happens. Might be good to note that we’ve already had our first complaints from readers. I’m curious what you all think and what you think about RSS in the first place! I used to scan my subscribed RSS feeds, but now I prefer email delivery. Thanks for keeping us in the loop! I also hate reading email newsletters. I think rss feeds should be replaced by social mediums like Google plus, Facebook etc. I think it can still come in handy overall, there are specific sites that do still require it. Really only use it for clients with WP other than that not at all. I don’t think RSS will ever completely go away. The News Media alone, will keep it alive. They need RSS to get their stories, from the various sources they get them (other than the AP – which is likely also using a series of RSS Feeds). I am curious though, as to how exactly, you DMCA’d those 40 websites? Do you have a process you can/will share? Thank you very much for adding your full RSS feed back. I’m a human, not a scrapper, and I use RSS. I definitely appreciate having the full feed in my in reader of choice (which is currently “NetNewsWire”). Thanks for listening to feedback and for all the great resources over the years. I think that partly, RSS is on the decline due to social media being on the rise and people sharing their stuff with friends and clients through systems they already use. I’ve ditched RSS as a means of checkin’ up on websites a long time ago. I found following Facebook pages and Twitter accounts more useful. You get a personal introduction and a link to the article. Reading articles all styles the same in an RSS reader just didn’t cut it for me. Not wanting to freak people out any more than they are already, but… I can pick up a tool that scrapes sites and then spins the articles into new pages in a matter of minutes. It’s possible to create whole new sites with dozens of pages over lunch (while eating). Add your affiliate links and start over again. By the end of the day, you have a dozen keyword-rich sites in different niches. This is not just an RSS issue, as the software cherry-picks from Google (rightly figuring that if the page is in Google it has some value). It will be interesting to see how this plays out over the coming year or two. All I can see on the bright side is that the resulting sites are very spammy and often quite bizarre, as they scrape and spin from different sources. You could have any Bono-related material mixed in with an article about German WW2 submarines. I’ve been following you for years, Thank you for all your tips. I feel RSS feeds have become obsolete. I rarely find people using them anymore. They are good to have, but I dont personally see a use for them. I think it´s really hard, if you start with a new site and scrabers steal the content. For beginners I think is that a good solution, but sites with an higher Pagerank should focus on the readers and their usability. Thanks for this, Joost. I really appreciate this. Do let us know how you get on with this. I’m a massive RSS user and fan and I’d love to see this work. Rel=author will solve the problem, it’s a matter of time, at the end, real people with original content will survive. I agree and was thinking about adding this as a thought. I’ve been wondering when people will start to see the full value of rel=author and I think this is it. I don’t see RSS going away, so I’m hopeful your thought is accurate. To add to my comment above … what’s your thought on that? Is it OK to scrape someone’s content and then spin it? If it passes CopyScape, does that keep it from being a copyright infringement? 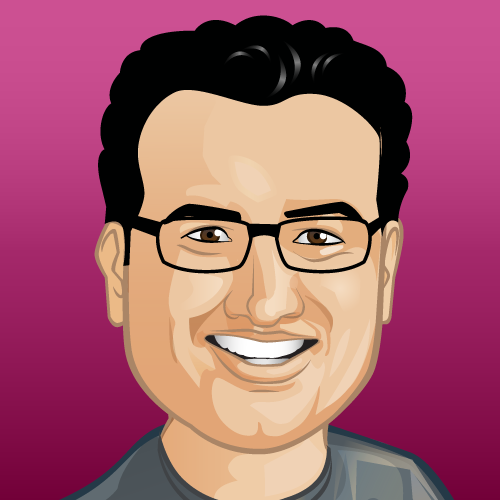 Hey Yoast! Just so you know, some of the newer scraping tools, like SEOZen, can now automatically convert external links to point to their own web assets. Not sure if it converts the follow/nofollow tag or not. It’s probably only a matter of time till they all do that. Then I guess you just have to hope that they also spin the content to pass CopyScape. How to use the RSS Submission tool? yes my friend this was good idea……i will remove RSS feed in my website….but There was big problem i.e how to share posts to facebook .. so on..?? I use Twitter a lot, but I still follow hundreds of blogs/site via RSS. I was upset with Twitter when they removed support for RSS in their 1.1 API but I understand why they did it. I’ve build several personalized news aggregators websites. I don’t mind using APIs but RSS is so simple for the user and publisher. Anything that ads unnecessary complications is a bad decision. It goes without saying I prefer full RSS feeds, there are ways to embed ads in them, I think that is a better solution than replacing a feed with a teaser. I put up my blog in 2005 and vowed never to turn off full RSS, I even went through a lot of work getting featured images to work properly in RSS feeds. I redid my entire homepage around RSS plus the Twitter API. I follow this site, and many others, by RSS. Although I read most posts by Yoast, that’s certainly not the case for the news sites I follow, so while I might read your content anyways, I most likely would read a lot less on news sites. I estimate that I scroll past about 75% of headlines, read about 20% of excerpts and click through to read the full post on only about 5%. I meant to say; I most likely would read a lot less on news sites if they didn’t provide at least an excerpt. Also, and I’m sure I don’t need to tell you this but I will anyways, the reason I still use RSS is because I can read at my convenience, I don’t want to miss anything by only relying on twitter or Facebook and I don’t want emails coming in at all times and distracting me. I stopped using RSS as a way to keep up with content ages ago and haven’t looked back. I can get everything I need from Twitter, much easier, much more social so I think you are keeping ahead of the curve here. Plenty will follow suit. I was introduced with the internet back in 2000 and have experienced the importance/need of the RSS feeds and I too had it used for me till 2007. Now my RSS is FaceBook where I am subscribed to the most important sites like Yoast! Thanks for highlighting this issue out for the people! I was an unknowing victim for six months from a RSS scraper that was ranking higher for about 10% of my sites content. I only found out by accident when I noticed a strange url linking back one day. I reported the site to the host. Which was completely and utterly useless when I filed a DMCA with them. It was only through filing with Google did they take action and remove the scraper from the index. But not before I changed the hotlinks on the images in the posts to name and shame them the offending site. I am still a big believer in RSS feeds. I use them everyday. I prefer them to email updates etc. However I understand the majority of people prefer email. And indeed the majority of people that convert to sales are also via email and not feeds. I also understand that it’s the more tech savvy person who’s likely to use RSS subscriptions over email. The private RSS feed mentioned above interests me. However so does the option of offering an excerpt RSS feed and a full email update. Is this possible? I know one can do something like this via Feedburner and Mailchimp using different feed urls. But with Feedburner “probably” going at some stage is there another alternative via WordPress to offer a partial feed and full email via a subscription company like MailChimp? 2. Send a full post to email subscribers. If I select “summary” in WordPress then the RSS feed is a summary (good) but so is the email sent out (bad) as the email uses the RSS feed for the content..
Netvibes is my newspaper with 100+ rss feeds. I really don’t know any other tool were I can read up on that much information with such ease. However I only read/skim the titles and click to the site or save it in Pocket to read it later. So I really don’t miss the full reader that much. I didn’t see the Whoopity Doo until I read it here haha! Simply, RSS feeds should be replaced by Social Mediums. Google sent the message by opening Google Plus and closing down their iReader. Even today i feel same RSS is not working in that manner in the manner RSS used too.. Rumors of RSS feeds’ demise are greatly exaggerated, and site scrapers don’t need an RSS feed in order to steal content. 2. Too many posts/articles. Less is more. 3. The author uses summary instead of full posts in the feed. If it’s all about the ad views for you, then more power to you. It’s not for me. RSS is in demise amongst our readers, I’m rather sure of that. I didn’t say that means it’s not important to those who still use it. And if RSS was truly dead, there wouldn’t have been the panic and near mass-hysteria over Google Reader shutting down this past July…..
Just the CNN feed alone had 24 million. Ah the memories this brings back. Blog and ping, which quickly turned into ping spam, which was quickly eradicated by Panda and penalized by Penguin (as you mentioned), and is now pretty much a #fuggedaboutit in my book. I am curious about your thoughts on AuthorRank and site authority and how switching from Google’s Feedburner to FeedPress might impact one or both? I had a gut feeling they were calculating subscriber data into the ago (or planned to), which is why Reader went away and Burner stayed. If a title is enough for you to convey the topic of your blog post it’s ok to shorten your RSS-feed. I am still using a feed reader to find new content and open the sites if it’s interesting enough. Anyway, regarding the “woopidydoo”: an excerpt is ok too. My jury is still out because I have yet to see a case study for Penguin where anyone could show that an RSS scraper site was causing an issue. That is not so much the fault of the analysts as it is simply the burden of the beast: Google won’t tell us which links are actually hurting, except in very rare cases. I can point to lots of sites that are heavily “scraped” by the RSS aggregator industry and they don’t seem to be suffering in the least. I would guess the people who are hurting may have invited the scraping more than the average site. Your nofollow solution is an elegant proposal. I hope that is sufficient if it turns out these sites really are causing a problem with the algorithms. I am curious to know if your click throughs from RSS have increased since you switched off the content. I personally love RSS. I’m still following several sites via RSS only and click through as needed, so I must say I’m not very happy when I don’t always get to read at least some part of the article (doesn’t have to be all of it) and click through as needed. RSS is a bit of a controversial topic. Do you offer RSS feeds at all? Do you offer excerpt only or full article RSS feeds? I think it comes down to your reason for having a blog in the first place. I blog for two main reasons. Firstly because I enjoy it and secondly to promote myself and my business through what I know. I don’t think I am alone in those reasons. So, does it matter to me if people view my content on my blog or in an RSS feed reader or indeed on a scraped site? It is an interesting question, and this article has made me think about it more deeply. There is a niggling feeling that I should say that it does matter. Those of us who have blogs have spent a huge amount of time building them. Since I am a coder I’ve spent a stupid amount of time getting my site the way I want it. If people read my content in a feed reader they’re not seeing it the way I intended. But actually, does any of that actually matter? Perhaps I am playing devil’s advocate here… but really? 1) So they are not coming to your website? But they are reading your content and hearing your name. Surely that is what you want? They’re probably sharing it with their friends and followers. They’re getting excited about your content. And if they REALLY like the content, they are going to click through to your website and leave a comment! 2) Of course they are going to stumble across other articles on your site. That is the point of RSS- subscribers will be notified whenever you post a new article. They will be your most loyal fan base. Your RSS subscribers are your gold. Be nice to them- give them what they want. If you do that- they will be your biggest advocates and will shout your name from the rooftops! 3) They won’t see your beautiful designs? I know this is a hard one. I am a web developer so I do feel the pain. But actually, what is the most important thing on a blog? It’s the content of course. Again, give your loyal subscribers what they want- the content! 4) Evil article screen scrapers. OK, this is a hard one. You have written an article. It’s your article. Copyrighted and all. How dare an evil scraper site steal your content? Yes it is wrong, but does it actually matter? You could argue that your content is being distributed to a wider audience. Perhaps not in the ideal fashion, but I really think this is the least of our worries. I know I don’t have a high profile a blog as yoast.com. but I hope I have a point here. I also wanted to say that although it is a shame that Feedburner is dying a slow and painful dead, it certainly isn’t the death of RSS. RSS is an open technology- like the world wide web and the internet. Being open is what makes the internet what it is. Also there are alternatives to Feedburner such as Feedblitz which I use. Anyway, my sermon is over! Thanks for making me think! Ian, I think you have a point yes, but the thing about scrapers is that they aren’t just a bunch of good people that are trying to help you spread your content to the world. They are a bunch of people who STEAL your work to PROFIT from it leaving you behind. So yes, in my opinion, it matters. Definitely scrapers are bad and are stealing your content. However I was just making a (albeit controversial) point that at the end of the day it results in your content being shared to a wider group of people. OK, playing devil’s advocate, but I think offering your loyal fans what they want is more important than stopping pesky screen scrapers! Would be interesting to hear about the results of these changes you made! I’m also an RSS nostalgic, and even though it’s more of an internal tool I use to optimize my work flow, it can still attract a quality audience. Regarding third-party scrapers, I was wondering if you gave any thought to using homoglyphs in the parsed feed. Basically, every occurence of “a” and “i” (to name the most common ones, that look absolutely identical in Cyrillic) is replaced by its homoglyph. It looks the same, so it doesn’t disturb the reader, and scraper sites won’t be able to rank on your text anymore even if you publish whole articles. Actually, this may seriously mess up with them, as Google might be wondering what this gibberish is all about. Something to consider also is third party sites such as Readability and Pocket. They way I use the service, and I could be using it wrong or a minority is from with Reeder (the only good iOS client for RSS) and bookmark what I want to read later. I don’t come to your site directly for the most part and this is where my question comes in, sort of tied to the above comments. If I don’t have your RSS feed, I don’t know when things are updated, in which I don’t read them in the feed, or add them to pocket to read later, and in return I never come to your site. I know it’s just one way to read content, as I have moved the majority of the sites I follow, including yours to my Twitter feed and I utilize Tweetbot (the only worth iOS client for Twitter) to catch my updates from sites I follow. I have been posing the question as a whole the last few weeks, what folks use for RSS and then instead of. Most people use Twitter now it seems for up to the moment updates, sometimes faster, much faster, than the RSS delivery method. Conclusion – you do as you want, you may loose a bit in your changes but overall, you need to do what is best for you and your site. And in turn I believe a lot of sheep will follow. We do still have RSS feeds, the excerpt / content is just empty. But you’ll still be notified of new articles. Ahh must have read over that extremely HUGE update haha. Interesting….hmmmm Darnit now you have me thinking. I am getting ready to launch my own tech-focused web site (for freelancers & micro SMBs) and this topic is extremely timely. To the point about subscribing to each new article (post), I”ve never thought that was a good idea, because I will offer my own email newsletter (each issue custom-written, Joost) & firmly believe in building my own in-house list. Sending each article out thru RSS defeats the need to subscribe, IMO. Thanks for a very timely and important message! Karen, whether or not you have an icon, your feed is still available for scrapers to find. You also have to be aware that scrapers scrape content that is in demand. A small budding site, no matter how cool, won’t have this issue on the outset. You would need to remove the feed entirely from the site to stop them, go private or do excerpts. Thanks for talking about RSS. It does seem to be less popular now than the old days. However RSS is absolutely central to the way I work. To be honest I don’t know how people cope without it. I subscribe to all the blogs I am interested in using Feedly. It means I can keep track of all the latest articles from all my fave authors. I can then read the article or share directly to my followers on my various social networks. I couldn’t do that effectively using email subscriptions or on Twitter. With Feedly I can put all my subscriptions in different categories and I can go through them at my leisure. Most of the RSS feeds I subscribe to give the whole article or in a small number of cases they give a summary or extract. I have to admit I find it frustrating when I’m not even given that, for example just the title. I know that’s the method you’ve adopted. I don’t like it, but I can cope with it because I know that I am always interested in your articles. That being said, it means I have to click through to your website from Feedly and it also means it’s not available offline. As a blogger I can understand why you would prefer email newsletters but as a consumer I am for full article RSS feeds all the way! I agree with Ian that I prefer full length RSS articles. The feeds in my RSS reader are about 90%+ full length articles. About a year ago, a few dropped back to excerpts and then recently, Yoast.com. Personally, my RSS feed is to inform me of new content and if possible, deliver that content. In the case of Yoast.com, I still click through to the site and read the article but I’m not checking the site every day. I don’t really notice if there has been a gap in posting new content on any site because when there is something new, I know about it. The bottom line for me is that if the RSS feed was a green button that lit up every time the author posted an article, it would be useful. Granted, not as useful as having the article delivered to me but with a click, I can read it. I can understand the need to control the distribution of your content better. Great that you’re pondering private RSS feeds. I wonder what you mean by that? I know Gawker and Liferhacker have what they call VIP feeds. I like that- these are full length article feeds for the real fans. If you could provide a way for people like me who are really interested in your articles (your fans you can call it) to subscribe to your articles in the medium of their choice then I think you’d be on to a winner. I won’t go on about this now, as I thought I’d comment separately. I think these fine folks are missing what RSS does entirely with their nose up in the air and their thinking that their piece of used toilet paper from when they went to the bathroom last is copyrightable. Folks SUBSCSRIBE to your site via rss or email because they want to FOLLOW your work. I simply make it easy for them to find you by posting a billboard on my portion of the information super highway. When you make it impossible for them to do so via excerpts, or turning off your RSS (whatever) feed because you want to remain EXCLUSIVE, you are turning off your readers. If not today, maybe tomorrow, or the day after that. I am a realtor, and what I’m hearing here is that you want to sell your “widget” or “service”, but you don’t want nobody to know about it because it is copyrighted. Now, if other people are using your work and claiming it as their own, I can understand that. But to view your work because they thought it was worth viewing? Now you are calling people liars when you know nothing about them? Yep, I am an unemployed software developer, age 55 and I’ve worked as a data ho for most of my life until the jobs went offshore. And yes, being a commission based realtor is the same as being unemployed when people can’t get loans to buy properties. As for something being wrong with me. I’m the only one that is speaking up for the people. I do not see you doing that. I do not see you offering them any concrete suggestions as to how to get their content in front of millions rather than a few hundred, which is what it will take to build a name for themselves. You guys are stooping awful low today. And to think I once thought your stuff was worth following. Like I said, all of your stuff has been deleted it. Like ian said, I followed your stuff because I was interested in it, and doing it via my google reader alternative at keep america at work allowed me to read it in its entirety, AND go to your article if I thought it was worth reading. 1) we switched all our normal content sites to excerpt only this year. 2) for a syndication partner, we built them a custom feed using Joost’s article on how to do that, with his template. This cut down a lot on some of the scraping. We also IP blocked content farms in Australia, and China, as well as Romania, Columbia, and Russia. – all in one place. It’s an efficiency tool… it takes me 5 minutes to scan 100’s of headlines and isolate all the new content that interests me that day – without having to visit 50 sites, one at a time, to see if there’s something there I “might” like. It also keeps my inbox free of email subscription notifications. If a site doesn’t offer a feed, I might bookmark the content that somehow caught my attention, but I won’t monitor the site for future content. How’s your newsletter sent? Are you not using your feed to gather the content or are you writing your newsletter yourself? We custom write our newsletter each week. We use RSS in our bulletin for our email subscribers. This way they get the updates of the recent articles in our page. For this we find RSS very useful. Besides that we do not use it. Even if the number of RSS subscribers is falling and driving less traffic directly I would be curious to hear, as a part of your experiment, whether indirect traffic drops when you pull back on the RSS feed. For example, I run a site called Lifestyle Frisco. I use Feedly to aggregate content from other sites that are about our city to make it easier for us to keep up with what they are publishing and know what content of theirs we want to promote. We don’t re-post their content, but we do share links to it, reference it, … all the kinds of things most publishers want other influential sites to do. So if I have Yoast as a part of my feed on SEO, WordPress, etc… and occasionally share your content via G+, Twittter, etc… when you disappear from my feed those shares are likely to decline due to the increased effort I have to go through to know what is new on your site. It may not amount to much by way of traffic but it could and would be interesting to see if you notice an additional drop off beyond the .5% you referenced. My main point of all of that is to say that their could be secondary effects that will be hard to predict and even harder to measure but should still be monitored. that’s the $64,000 question indeed… We’re closely monitoring that and we’ll report back. I’ve taken the feed off all my business sites; there’s no good reason to leave it on, and lots of bad reasons. I leave it up on my personal site, because that one doesn’t matter so much. Email is great but when I’m traveling/mobile for an extended period, it’s very easy to get way behind on email. During those times I still read my RSS feed looking for valuable nuggets among the noise. RSS (via Feedly, for example) is a great way to “triage” while traveling. I mark the ones I want to read later, and pitch the noise. When I read later, I usually end up on the website. If I like the article, and depending on the subject, I take action or save it in Evernote. Bottom line: I think website owners should quit fearing RSS and start embracing it. Quit thinking of it as a sales tool and start thinking of it as a marketing tool. Think of RSS as just another way for me, your reader (and prospective client/customer), to follow what you are doing. When I’m ready to buy, I’ll find you. Why would any website owner want to shut me out of RSS and rely on email only? And your explanation is important and greatly appreciated because there are definitely real world SEO issues with RSS (and every other marketing channel). As a regular dork-Joe user, I have literally hundreds of RSS feeds that consolidates content from my favorite sources every day. I use Feedly on all of my devices, and I stroll through dozens of article headlines every day. The ones that are attractive to me, I click on – usually going to the native site of the article (say, Adventure-Journal.com for instance). I love having the content organized and delivered so simply and cleanly. So I guess my question is, if RSS is going away, what product am I not aware of that satisfies this need (at least in the same spirit of how I interact with news content)?? I agree, I want to know how everyone else gets their information organized and only the information they want. doesn’t seem like Twitter or Facebook does that very well. I am a huge fan of reading RSS feeds still, and primarily use Feedly. I was sad to see only the title of this article with no useful content of this article in Feedly. I agree, Courtney. I am a huge fan of RSS feeds, and use Feedly to read hundreds of blogs every day. I hate subscribing by email, because then my inbox gets crammed with hundreds of emails. I too was a bit frustrated when I saw the “This is a new post on yoast.com, Whoopity Doo!” message for this feed. I’m not an expert Joost, but you were so surgically and right with this post… What I can say is that my site get in a penalty behaviour because Google Penguin not recognizes scrapers 1:1 copying through RSS feed vs the source (never bought a link). Think I’m going to use your snippet and put in the content of the feeds a phrase some like “Hey bro! There’s a new post online! Get this and next directly into your email by subscribing to (link at the form). There’s no way to stop scrapers copying from my feed, and maybe the worse Google’s ideas doing just the job that claims. Although I like the idea behind RSS and I myself used to be an avid user, but I hate the way Google wrongly let aggregators rank above and sometimes even replace my (my clients) results. Last year I did a little research and found several cases where a RSS scraper replaces or outranks the original article. One of them is the following article which is published on the 1st of November 2011. When not using intitle the original ranks 1st, but giving a site with no original content and a RSS import plugin the ability to steel away some of the trust and traffic is just really annoying. And keep in mind that this specific problem exists for over a year now. Next to the above every body who monitors competition knows that if you have enough authority you’ll still be able to steel content and outrank the original source. I see it happen on a daily basis. The problem isn’t in RSS or the way you should use RSS, the problem is the way Google handles cross site duplicate content; they should fix that. Even without RSS everyone with a bit of knowledge about Xpath will be able to parse HTML just as easy as RSS. For the time being I would suggest either to remove the content from your feed or delay the publishing of new articles in your feed (I’ve seen a couple of cases where this helped). RSS is something you really like or you don’t care about, and nothing is wrong with that. But it’s something those who do like, love. I went to excerpt only RSS years ago, and it works well. I would never suggest dumping it, since there’s no harm in that, and people who like it are happy. That said, I am a little bummed that there is no excerpt for Yoast Posts. RSS is important for me, because i felt heavily stressed for years before I came up with a special RSS-Aggregator for my Browsers startup page. Please don’t make me wasting hours at Twitter & Co ever again. I think there is something that is missing here. Folks, you write articles to get your products, or ideas in front of people. When you disable your RSS feed, you are not hurting the site like Keep America At Work that is aggregating your articles. If you will look at Keep America At Work you will see that I grab, or attempt to grab selective articles that will help people with housing, utilities, food and other essentials AND introduce them to the technology that they need to go forward into a technology based future. As funds become available, I will be creating more sites like Keep America At Work focusing on different aspects of our society. I do this because nobody else is doing it and it needs to be done, and I do it because somebody has to do their part when more and more corporations are sending our livelihoods to cheaper countries which is destroying peoples lives here at home in America, and in Europe. As for disabling the RSS feeds, you are simply creating a situation where a person that follows 1,000 sites needs to go to 1,000 separate sites to stay up to date, and since nobody has time, you’re not hurting your reader as they will eventually quit and follow somebody else that makes it easy to follow the sites that they want to follow. Obviously you haven’t even looked at Keep America At Work. Many of our people in all of our countries are hurting. I myself am an unemployed software developer, and there are many of us out there. And trust me, I haven’t made any money from google, etc. as the last 100 bucks I received from them was over 2 years ago. Here is an example of what I do. This youtube video just came across my feed. It is in german and even though I am of german descent, I don’t understand a thing that he is saying. Yet he is sharing his way of “pimping his bratwurst” and I’m going to do my best to drive traffic to him because he deserves it for sharing. If that is my crime. But I’m working to make things better and you guys and gals are crying over people reading your stuff?? depending on your country’s laws of course, here in the U.S. and those countries that subscribe to international copyright laws, “fair” use still requires permission unless expressly used in quoting editorial content. Nice work educating the less-informed (i.e. new folks like us) and others*, Joost. Keep up the good work; it’s appreciated. PS – Joost, you’re too nice. I’d DMCA his a$$ anyway! Virgil, you might not understand it, but you’re scraping. If you don’t have the explicit consent of the author, that’s a crime against copyright. I will not give you a break, if you ever do it to me or one of my sites again, I’ll DMCA you and your hosting party. You wouldn’t be the first site owner that suddenly saw his site disappear and his domain name disowned because he didn’t want to listen. actually I have contacted the copyright office for clarification and so far, I believe that you are wrong. Here is my thoughts, and my communications with them. Your feed will be removed by today. Your articles will be removed by today. Your plugin will be removed in a few minutes. Thank you. Removing our plugins doesn’t hurt us Virgil, that hurts you. You copying our content does hurt us. I really don’t get the idea behind RSS, I’ve never really used it and prefer to remove any RSS links to reduce the chance of scraper bots stealing content. I think there are so many social platforms out there that you don’t really need RSS as much anymore. I’m in agreement with David. It has nothing to do with search and everything to do with social. Social networks help curate news and information. As well, the number of blogs has and continues to explode over the years so adding more and more feeds to a reader is not longer manageable. I read something fascinating on RSS soon after Google Reader shut down, and the conclusion was something like “although the quantity of readers was low, the quality was quite strong – they were usually bloggers & journalists.”, which is probably why it got a huge amount of press coverage. It’s probably stands to reason that by changing from full length to titles, you’ve probably rattled the a group of readers who will probably raise a complaint, rather than shrug and just get on with it. Each to their own. I can completely understand the decision taken though :). I think Google gave us a hint when they did away with their own reader and also the Alert Feeds (which have since been brought back). I wonder if the reason for the alerts going away and then coming back was to do just that, make them no-follow. One of us will have to look into that. I published an article recently and a snippet was immediately republished by Topix.net. Their version was also indexed by Google before my version. Now they rank #1 for the title I used even though they have just a snippet AND a link back to my site. If you need RSS feeds (say to participate in services like Zemanta), I recommend trying an RSS feed delay plugin which’ll give your article a chance to be indexed on your site before it appears in your feed for others to copy.